Bruno Mars is one of the biggest pop and R&B singers of the past twenty years, having a career that is seemingly defined by an endless supply of hits and bangers. Every year he releases a new bop that gets stuck in the collective consciousness of America, like a national earworm infecting populus. This year’s edition sees him team up again with a living embodiment of the American dream, Cardi B. Cardi has been on a roll since her debut, previously appearing on the Bruno’s smash hit “Finesse” in 2018. Now recieving primary billing with Bruno, the duo are back with “Please Me”, a slow jam disguised as a upbeat trap song that has already reached #3 on the Billboard Hot 100. Bruno’s crew looking fresh in East LA’s hottest styles. The song is a slow jam where Bruno croons in his usual, stellar way, but this track is dominated by Cardi. She gets a showcase verse at the very beginning, and also aids the chorus while matching harmonies with Bruno. The songs subject matter is heavy with sexual innuendos and references, and while that usually tends to be presented from the male point of view, Cardi takes complete control and makes the content her own. This just goes to show how big of a star she is, and how much respect she commands on a track. There’s just something right about the sight of black high top chucks on a taqueria floor. The music video begins with some late 80’s neon flashing across the screen and telling us that this takes place “somewhere in Los Angeles”. The camera pans into a taqueria where Bruno and his friends are munching down on a plate of tacos. 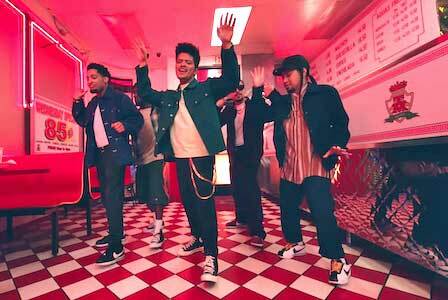 We see that they’re dressed in your standard, urban LA style, which means flannels, slacks, and chucks for Bruno. The groups ensemble really sells the look of East LA. Cardi and her girls walk in and the music kicks in as Bruno spends the video begging her to please him, and she shows him her best assets. For Cardi, there’s a lot of twerking and grinding while she keeps the energy up. 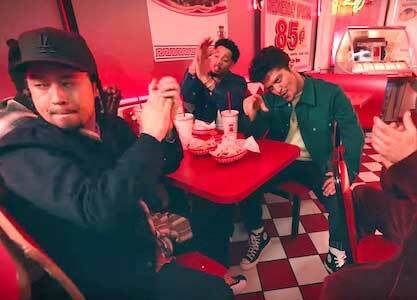 Bruno performs some slick dance moves with his crew, and overall the video is very similar to the “Finesse” video. The video ends with everyone getting in a parade of lowriders and driving down the streets of LA, capping off a very old school but fun video. 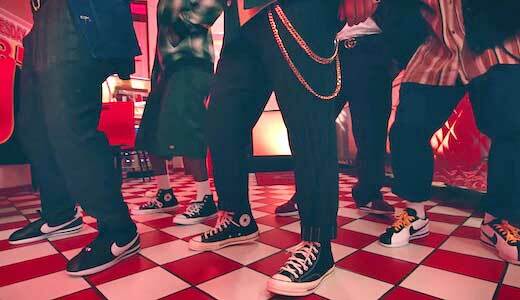 Bruno Mars wears black chucks throughout this video. Use the links below to get a new pair of chucks you can wear to please yourself and others.